Home / Blog / Is Biltong Safe During Pregnancy? Is Biltong Safe During Pregnancy? Biltong cravings seem to be a pretty common thing among South African mama’s to- be. Although this doesn’t come as much of a surprise – it is a delicacy after all – there’s a lot of debate as to whether it’s okay to give into said cravings. 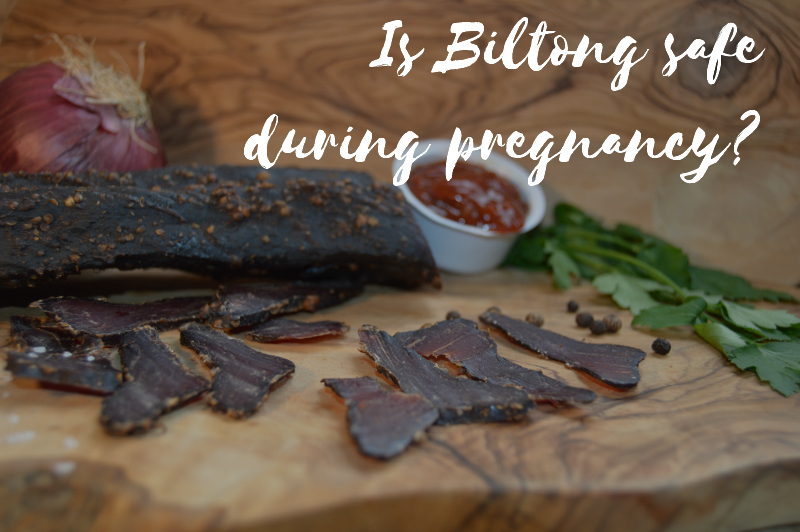 So today we ask, is Biltong safe during pregnancy? We won’t dwell on the benefits too much, as we’ve already discussed the five benefits of biltong here, but let’s quickly recap. This means Biltong not only helps with muscle maintenance but it also promotes healthy blood cells and bones while ensuring the release of energy from the food you’re eating. In simple terms; it keeps your body healthy, gets the energy flowing and helps control weight. Before we get into the risks, let’s define Biltong again. Made from strips of Grass-Fed Beef Silverside, Biltong is marinated and spiced, before being hung up and dried in a controlled environment. This, of course, means that Biltong isn’t actually cooked in any way. So despite being safe for consumption, Biltong could be susceptible to Listeria, which is bacteria that can be found in raw meat. What does this mean for your bump? Well, Listeria is also responsible for Listeriosis, which causes fever, aches and pains, nausea and vomiting and when left untreated, could lead to a miscarriage, premature birth or even a stillborn baby. Although rare – they record less than 30 cases of Listeriosis in pregnant women per year – it’s still a risk worth noting. So, why exactly is Listeria more dangerous for expecting women? As the physical shape of your body changes during pregnancy so does your immune system and things that were easy to fight off before, suddenly becomes increasingly more difficult. As your body continues to try it’s best to ward off any nasties, the risk of something slipping through its defenses becomes greater. With all of the above in mind, it’s easy to see that although there are many benefits to Biltong – as well as it being SUPER TASTY – there are also risks. We’d advise getting in touch with your doctor first to double check and if they aren’t on board, it’s probably a good idea to listen to them. Always remember… we’ll have PLENTY of Biltong waiting for you when it’s safe for you to eat. To read more about Listeriosis, click here. Do you agree? Let us know what you think by commenting below or heading to Twitter, using #BiltongPeople.